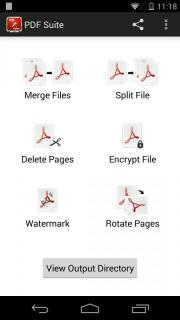 The best and the most complete PDF Utility application !!! 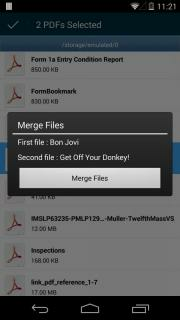 1) Merge Files – Join 2 PDF files into a single one. Ever had trouble managing multiple files ? Now you can combine them into a single PDF file, making it easy to share with friends. 2) Split File – Cut a big PDF file into 2 smaller ones. Have a file that is too big ? Now you can split it into smaller units. Making the sizes manageable. 3) Rotate PDF – Turn a page / group of pages of a file. Have a PDF file where some pages need to be rotated ? Use the ‘Rotate PDF’ feature to turn the pages by 90 / 180 / 270 degrees. Want to protect your confidential information ? Use the ‘Encrypt PDF’ feature to add password protection to your PDF file. Need to ensure that you get proper ownership of the content you generated ? Why not add a watermark to the PDF file ? With our ‘Watermark PDF’ feature, you can embed a text on everypage of the PDF that indicates your ownership. Great for embedding copyright information. Ever felt the need to delete some selected page / group of pages from a PDF file ? If yes, the ‘Delete Pages’ feature gives you the control to remove pages and the corresponding bookmarks & links. Great way to reduce size of PDF document. The application uses the open source library ‘DroidText’ which was located at (https://code.google.com/p/droidtext/).